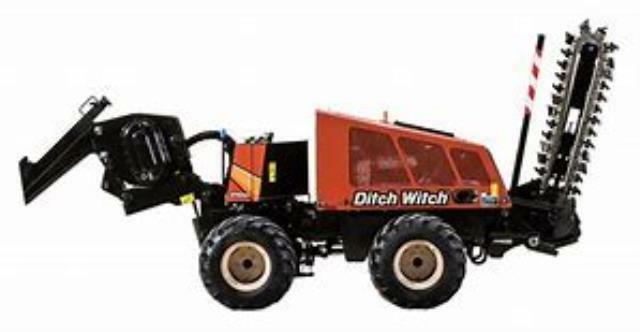 VIBRATORY PLOW , INSTALLS WIRES OR SPRINKLER LINES BELOW THE EARTHS SURFACE WITHOUT DAMAGING THE TOP LAYER OF GROUND. HAS 36" TRENCHER ATTACHMENT AND A BORING ATTACHMENT FOR HORIZONTAL LINE BORING. IT IS SIMILAR TO A KNIFE GOING THROUGH THE GROUND. THE WIRE OR TUBING GETS ATTACHED TO THE PULLING KNIFE AND IS FED INTO THE GROUND AS IT OPERATES. CAN BE TOWED WITH A SMALL TRUCK OR SUV ON ONE OF OUR SINGLE AXLE TRAILERS. REQUIRES SOME PRIOR KNOWLEDGE OF USAGE AND TECHNIQUES. SOIL CONDITIONS MUST BE RIGHT FOR THIS UNIT TO PERFORM PROPERLY, ROCKS AND SHALE WILL STOP IT FROM WORKING CORRECTLY. * Please call us with any questions about our vibratory plow walker 410sx rentals in Flemington NJ, Somerville, Flagtown, Frenchtown and Western New Jersey.